Maximum Mould Release Wax Provides the maximum number of releases per wax application. Costly blend of imported waxes. 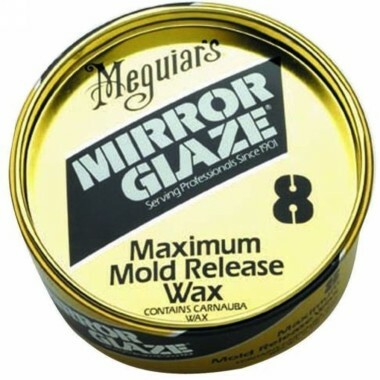 The industry's first and still the most widely used mould release wax. Excellent to use when assured release power is required. USAGE TIPS: Apply evenly to surface by hand or Dual Action Polisher. Allow sufficient time for wax to set up on mould surface approximately 5 to 10 minutes depending on climatic conditions When wiping off wax, break the surface by wiping off excess wax. Then turn to clean portion of cloth and buff remaining residue to high gloss finish. 311g.